Roc de Cambes is located in the Cotes de Bourg appellation. This is not that far from St. Emilion. In fact, the estates geographical location provided the inspiration for the name of the domaine, as it is located in the commune of St. Laurent des Combes. 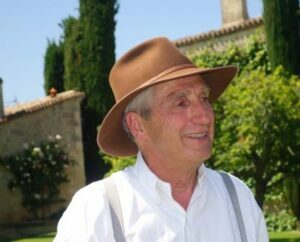 Soon after Francois Mitjavile purchased the vineyard in late 1987, he named his new winery, Chateau Roc de Cambes. When the owner, Francois Mitjavile purchased the estate in 1988. At the time, Roc de Cambes required extensive replanting work in the vineyards and modernizations in the cellars. The chateau that was constructed in the mid to late 1700’s also needed renovations. Interestingly, Roc de Cambes has a terroir that is not much different from Tertre Roteboeuf, their legendary, St. Emilion estate, which is also owned by the Mitjavile family. That explains in part, why Roc de Cambes was purchased by the Mitjavile family. The 12 hectare vineyard of Roc de Cambes is planted to 75% Merlot, 20% Cabernet Sauvignon and 5% Cabernet Franc. The terroir is mostly limestone and clay soils, similar to what you find in the Right Bank of Bordeaux, especially in Saint Emilion. The vineyard has a south by southwest exposure on the peak of a plateau, with a view of the river. The vines are old. In fact, many of their vines used for Roc de Cambes are close to an impressive 50 years of age. They have vines that are more than 50 years old, which adds to concentration, character and complexity in the wines. Roc de Cambes is vinified in traditional concrete vats. Malolactic fermentation takes place in French oak barrels. The wine is then aged in an average of 50% new, French oak barrels for between 18 to 24 months before bottling. They also produce Domaine de Cambes, which is not considered a second wine, as it comes from a different terroir and grape source. Domaine de Cambes is not in the boundaries of the Cotes de Bourg appellation. The vines are much further down the slopes and they are closer to the Gironde, creating a cooler terroir with more clay in the soils as well. 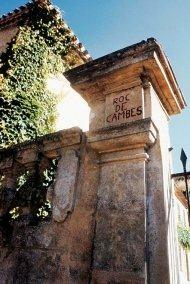 However, the Merlot dominated blend used for Domaine de Cambes can be quite similar to Roc de Cambes. Domaine de Cambes, unlike Roc de Cambes is labeled and sold as a Bordeaux AOC wine. Chateau Roc de Cambes is much better with at least 4-6 years of aging in good vintages. Young vintages can be decanted for 1 hour to 90 minutes. This allows the wine to soften and open its perfume. Older vintages might need very little decanting, just enough to remove the sediment. Chateau Roc de Cambes offers its best drinking and should reach peak maturity between 5-15 years of age after the vintage. Roc de Cambes is best served at 15.5 degrees Celsius, 60 degrees Fahrenheit. The cool, almost cellar temperature gives the wine more freshness and lift. Roc de Cambes is best paired with all types of classic meat dishes, veal, pork, beef, lamb, duck, game, roast chicken, roasted, braised and grilled dishes. Roc de Cambes is also good when matched with Asian dishes, rich fish courses like tuna, mushrooms and pasta. Today, Roc de Cambes is clearly an easy contender for the top Bordeaux wine from the Cotes de Bourg appellation. The Mitjavile family recently added Domaine lAurage to their holdings. Located in the Cotes de Castillon appellation, the debut vintage for Domaine l’Aurage was 2007. It’s definitely an estate to watch in the Cotes de Bordeaux appellation as it combines quality, character and price. Wet soil, tobacco, truffle and black raspberries are found on the nose and on the palate. The wine is juicy, bright and fruity with herbal complexities in an earthy finish. Wet earth, forest floor, truffle, tobacco and dark red fruits are served up in a ripe, juicy, fresh, medium/full bodied, rustic style. Earthy, truffle, licorice, salt, brioche and black cherries open the nose. Full bodied, with fresh, cherries, the wine is concentrated, full bodied, and offers something wild and refined at the same moment. The finish is fruity, earthy and juicy. Olive tapenade, thyme and red fruit aromas emerge easily. Medium/full bodied, with spicy, sweet cherries and herbs with a fresh, earthy, finish are found here. Wet earth, spearmint, licorice, cocoa and plums smell and taste great. The wine is silky, polished and rich, there is volume and freshness that drives home the fruity qualities in the finish. This is the best Roc de Cambes ever produced. Spicy, mineral driven, earthy, dark berry focused nose with a structured, full bodied, powerful, concentrated, fresh, tannic wine. This definitely needs time in the cellar to be fun to drink. Vanilla, smoke, wet earth and dark fruits with a touch of herbs create the complex nose. The wine is medium bodied, with a gently rustic, dark cherry and tapenade filled finish. You can drink this young, or age it for a few years. Dominated by Merlot the wine shows vanilla, smoke, dark red fruits, herbs, spice and earth in character, the wine an olive tapenade and herb infused, dark red fruit experience. Distinct aromas of truffle adds to the plum and stone personality in this open, medium bodied, ready to drink wine. Easy drinking, plummy, black cherry, round wine in a crowd pleasing style. The wine offers minerality, truffle, blackberries and wet earth scents, with good density and a spicy, fennel, black raspberry filled finish. Truffle, earth, red plums, juicy berries and a fresh, ripe, spice filled finish. Coffee, cocoa, truffle, black cherry and stone, medium body and a soft, forward, sweet, red cherry finish. Earth, smoke, mineral, black plum and coffee scents open to a mineral driven, red berry finish. Full bodied, earthy, still on the young side, with ripe, juicy, fresh, crisp, dark plums, black cherry, forest floor and truffle notes. Just starting to open, an hour or so in the decanter should add a lot to the wine. Nice wine, a little rustic in its tannins, but offering a lot of vanilla, blackberry, black raspberry, earth and spicy charm that softens with air. Drinking well today, it might gain a bit more complexity with age, but there is no reason not to pop a cork today. Like opening a jar of truffles and tasting ripe cherries, this was quite a nice surprise. Truffle and cigar box notes dominate the nose. On the palate, the wine is all about the cherries. The fruit is not overripe, but it is fading. Fully mature and on the downhill slide, there is still complexity in the earthy, tobacco, oceanic nuances that blend perfectly with the ripe cherries. A little bit rustic, but still charming, the wine needs consumption. Earthy, with a distinctive truffle, tobacco and olive drenched nose, the rustically styled wine showed much younger than its true age. Still, this is a not a wine I'd hold for further development. Fully mature, the wine is more interesting with its earthy, tobacco, leaf, cherry, forest and cigar aromas than on the medium bodied, earthy spicy, red plum palate. If you are holding a bottle for further evolution, you are better off popping a cork, that waiting any longer.